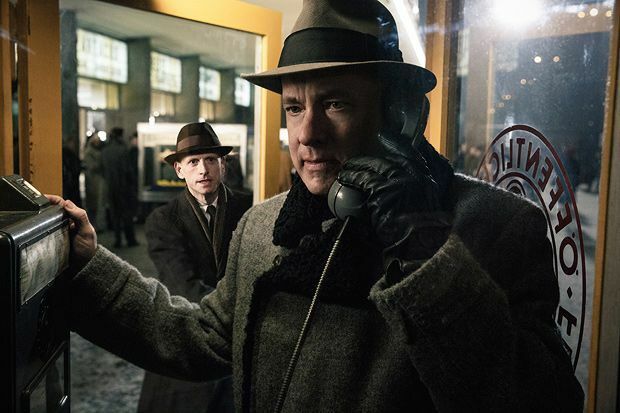 Whenever Steven Spielberg and Tom Hanks combine forces, the outcome is impressive. And so it goes with their latest, Bridge of Spies, a Cold War drama that feels like a worthy companion piece to their World War II efforts, 1998 Oscar-winner Saving Private Ryan and the 2001 HBO series Band of Brothers. Shot on celluloid, it’s stately filmmaking full of old-fashioned craft. Set in 1957, Bridge of Spies tells the real-life story of a delicate prisoner exchange that took place after a U-2 spy plane was shot down over Soviet territory, leaving airman Francis Gary Powers (Austin Stowell) imprisoned. Meanwhile, in New York, the Americans arrest a Russian spy, Rudolf Abel (Mark Rylance), a rather gentle soul who seems resigned to his fate. Hanks, who has forever been compared to Jimmy Stewart, plays the most Stewart-like character of his career in James B Donovan, the insurance lawyer brought in to provide Abel with pro bono legal representation. After pleading for his life, Donovan soon finds he is in the midst of a fragile power play between the Americans and the Soviets, with Abel a bargaining chip. Events are complicated further when a second American – economics student Frederic Pryor (Will Rogers) – is captured by the Berlin Wall (eerily shown mid-construction). The upstanding Donovan, who heads to Germany to conduct the negotiations, wants a two-for-one exchange, and much of the film’s escalating tension derives from this stand-off. Boasting a script that’s been polished by the Coens, the end product is taut and engaging. Hanks is as dependable as ever but it’s Rylance who shines. Already cast by Spielberg in next year’s Roald Dahl adaptation The BFG, his work here is beautifully nuanced. After years of acclaim in the theatre, and his recent outstanding turn in TV’s Wolf Hall, it would seem now is the time for him to soar on the big screen. General release from Thu 26 Nov.